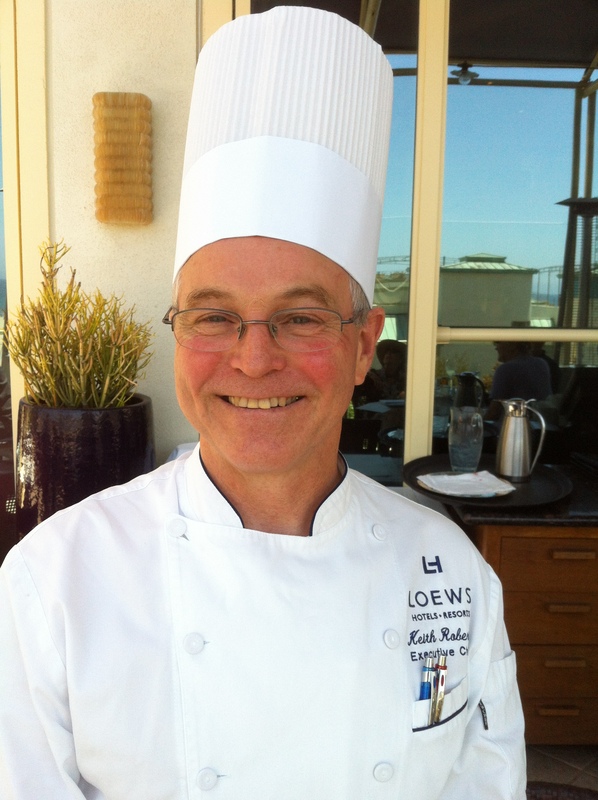 Keith Roberts, Executive Chef at Ocean & Vine at the Loews Santa Monica hotel may be one of the nicest chefs in Los Angeles. I met Roberts with some friends at Ocean & Vine on a glorious summer day for lunch. Roberts enjoys coming out of his kitchen to stroll through the dining room and outdoor patio. While looking over the menu, Roberts introduced himself. Roberts is an avid surfer so he resides in Manhattan Beach and works in Santa Monica. He worked at the Brown Derby in Hollywood before the iconic landmark closed. At Ocean & Vine, Roberts offers his Hollywood Cobb salad on the menu. “I know how to make a truly authentic one,” Roberts said with a smile. “My philosophy [about] salads is to make them fun looking. I add new ingredients to jazz up a traditional salad.” He shops every Wednesday at the Santa Monica Farmers Market to find the freshest ingredients. Roberts perfected his culinary skills at La Rive Gauche in Palos Verdes. “We were one of four Los Angeles restaurants with three stars. The Executive Chef expected perfection from everyone,” Roberts said. The training later helped him cook with confidence and heightened his attention to detail as an Executive Chef. We ordered two appetizers and three of his enticing salads to share around the table. A lovely array of breads were delivered to our table – crispy flat lavash bread, soft tomato bread, both are made in the kitchen, sourdough and pretzel bread. The basket is accompanied with Roberts “secret weapon”, a delicious scarlet pepper pesto for dipping. He created this in the mid 90s while working at a Hungarian restaurant. Our first appetizer was a rock lobster martini. 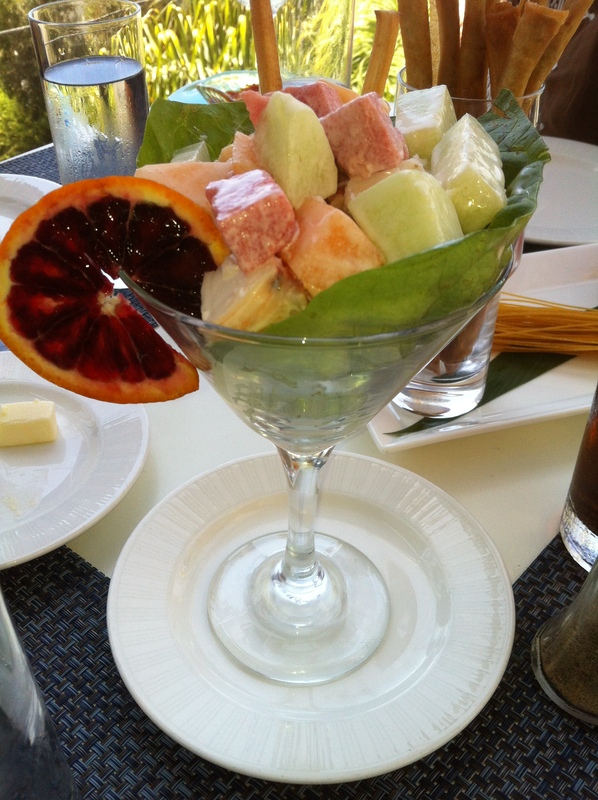 Chilled rock lobster is mixed with Tehachapi sweet honeydew and cantaloupe melon dressed with a yogurt glaze. A slice of a lovely red blood orange adds the finishing touch to this starter. The swizzle sticks appetizer arrived looking like crispy breadsticks, yet tasted like lightly fried chicken wontons. Served with a classic sweet and sour sauce for dipping, the thin sticks are made with wonton skins filled with finely diced chicken, scallions and bell peppers. We nibbled them all up. The beautiful baby spinach salad was topped with wok fried Diver scallops and dressed with a slightly zippy peanut dressing. It was quite good. My favorite salad was the papaya, cucumber, and Tamarind marinated shrimp served with a mild curry dressing. Crispy lentil papadums adorned the dish. Shaped as tortilla triangles, these Indian flatbread chips offer a delectable crunch to this colorful salad. The crab Louie salad was the most artistic of the three salads with vivid slices of heirloom tomatoes arranged to look like rays from the sun. Served in a slightly firm avocado, the salad is jazzed up with an updated cocktail salsa made with fresh heirloom tomatoes, celery seed and vinegar. Read the rest of my article by clicking on this link – http://parklabreanewsbeverlypress.com/news/2012/08/ocean-and-vine-satisfying-the-senses/. Published on Aug. 30, 2012, courtesy of the Beverly Press and Park LaBrea News.